FIR Sauna Body Shaping System Far Infrared Rays are invisible light that was discovered by a scientist that they are a spectrum of sunlight. Far Infrared Energy is absorbed very easily by the human body and helps in all aspects of bodily growth and development. It is very healing and rejuvenating. It energizes the cells, inner tissues, glands, nerves and organs beneath the skin. Far Infrared Rays are the safest and the most beneficial types of rays that penetrate deeply with a very uniform warming effect. How Far Infrared Rays (FIR) Works? The intensity of FIR produced by the human body constantly fluctuates. Studies suggest FIR helps to maintain general health and prevent disease. 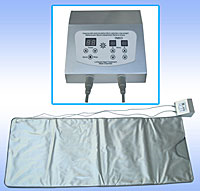 Far Infra Red helps relieve chronic fatigue, stress, nervous tension, toxicity, arthritis, insomnia, rheumatism, pain, high cholesterol levels, diabetes, back problems, muscle pain, abnormal nerve function, sports injuries, respiratory ailments, digestive disorders, poor circulation, viruses, and much more. It also helps with the excretion of harmful substances such as heavy metals, it stimulates enzyme activity in the body and reduces acidity. It aids detoxification, improves metabolism, boosts the immune system, eliminates waste from the body, improves lymph drainage, prevents the growth of bacteria and much more. 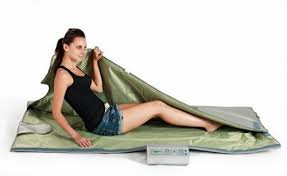 The FIR Sauna blanket is like a sleeping bag that you get inside. Unlike the Far Infra Red cabinets, that have three FIR panels in them, the blanket is 100% FIR giving you a much more successful detox. Far Infrared benefits are immediate and amazing! Regular sports take time and always carry the risk of injury. While active exercise and balanced diet are excellent for good health, an equally good substitute – the amazing new Far Infrared Sauna – lets you stay healthy in pleasant and relaxing way. Soft, soothing Far Infrared heat helps receive the all-round ‘training effect’ (30 minute FIR sauna = 10km run) while reading, watching TV, talking on phone, listening to your favourite music or simply relaxing. Spas would find Fir Sauna Blankets an invaluable addition allowing them to provide added services and to greatly increase turnover. FIR SAUNA Body Shaping System – also revered to the “BodyMelt” Melt away fat while burning inches in our FIR SAUNA Body Shaping System. This treatment has something that no other conventional body system can do: It reduces fat and promotes healthy skin while removing toxins. Plus, you will get the following results: increase your metabolism, burn fat, lose weight (not just water and inches), help reduce the appearance of cellulite and stretch marks, have more energy, improve skin texture, relieve stress and reduce aches and pains due to joint stiffness, fibromyalgia and more. With your FIR SAUNA Body Shaping System treatment you will be wrapped into a comfortable Infrared blanket for a deeper relaxation experience Decrease BMI, Body Fat and Lose an average of 1-2kilograms in 30min. Rest cocooned in the blanket, as Infrared Heat raises your core body temperature, and releases toxins. Burn up to 600 calories, stimulate your metabolism and lose 1-2 kilograms in one session. The FIR SAUNA Body Shaping system emit Far Infrared Rays and this heat therapy can aid in weight loss by speeding up the metabolic process of vital organs and endocrine glands, resulting in substantial caloric loss in one body wrap session. Sweating is part of the complex thermoregulatory process of the body that increases the heart rate, cardiac output, and metabolic rate. The process requires a large amount of energy and reduces excess moisture, salt and subcutaneous fat. Fat becomes water soluble at 40 degrees Celsius and then allows the body to sweat out fats and toxins. What is the targets fat loss opportunity from using FIR SAUNA Body Shaping system heat therapy? As every individual is different, fat loss from an FIR SAUNA Body Shaping system will depend upon the physiological make-up of that person. So the greater the excess weight someone has, the faster and more dramatic results will be seen. Some people may not experience a great weight loss, but will see an improved body appearance by losing inches or dress sizes. Extremely physically fit people that don’t carry excess weight or inches can experience much improved muscle tone. The more physically active a person is, the greater the benefits that can be achieved from an infrared body wrap. A less active person may take longer to see results as their body must grow accustom to the FIR SAUNA Body Shaping system heat therapy. Of course if a client who is using an FIR SAUNA Body Shaping system eats or drinks excessively, most of the results from the infrared body wrap treatment will be wasted. Common sense tells us that as with any body treatment or system to help one attain a better physical appearance, one must adjust their nutritional needs. Ideally, an FIR SAUNA Body Shaping system treatment will be most beneficial for those who stick with a balanced and healthy eating program. Clients that lead a very sedentary lifestyle can still achieve great results, but will require a longer period of time. Again, they too must take control over their eating habits to obtain their desired results. My experience using the FIR SAUNA Body Shaping system on myself and on clients provides a body reduction of at least one size in approximately 6 – 10 FIR SAUNA Body Shaping system sessions and spacing the sessions on with 2 to 3 days between each session. Although this is the standard results I have experienced and I have seen, but as I stated earlier results are different on every person and dependent upon their body type and lifestyle.